As I noted in my last post, savings bonds have wrinkles that are important to understand to get the most out of owning them. As of today (7/19/2010) the federal government is issuing two kinds of savings bonds: Series EE and Series I. Today we’ll discuss the basics of the Series I savings bond. We’ll make several references to the previous post on Series E bonds [LINK], so if you haven’t read it, you might want to check it our first. Series I bonds were first introduced in September 1998. Like Series EE bonds, they can earn interest for thirty years, and also like Series EE bonds you can’t cash them in for the first 12 months after purchase. If you cash them in within the first five years, you lose three months of interest. Unlike Series EE bonds, the interest rate is not the same each month. Two components make up the interest rate on a Series I bond: a fixed rate that is set at the sale date remains throughout its life, and an inflation rate (which is why the bond is called the Series I.) The fixed rates are changed each May and November for bonds sold for the next six months. 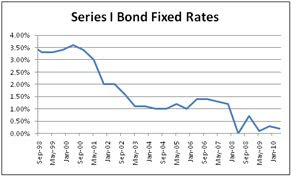 The graph below shows the rates since the bond’s inception. The maximum fixed rate was 3.6%; the minimum is 0.0%. Total Rate = Fixed Rate + 2 x Inflation Rate + Fixed Rate x Inflation Rate. When the inflation rate is less than zero, the calculation is performed as described above, but the final result cannot be less than 0.00%. In other words, you never lose any interest you have previously earned, even in the case of severe deflation. Tax Advantages. The tax advantages are the same as for Series EE bonds. In the next post we’ll talk about the ways you can buy and redeem EE and I Bonds. In the final post of this series I will also provide my thoughts about when the bonds might be good to include as part of your portfolio. Next Up: How to Purchase and Redeem Savings Bonds.